My name is Kristof Harnos I come from Csömör/Hungary. Csömör is a little village approximately 10 km form Budapest. In 6. January 2014 I had a car accident. I was a passenger in the car, unfortunately I suffered the most serious injury. Fortunately, the other 2 passengers (including the driver) were fully recovered. In the accident a broken my spine, cause of the accident I have a full spinal rupture at the vertebra of the T-12 spine. I managed to process the trauma in 6 months, after 9 months I started to training/bodybuilding. One year after the accident I took part in a bodybuilding competition where I finished first place in my category. The first place meant, I became World and European Champion. The love of this sport fulfills my whole life. My goal is to give my knowledge and experience to others who just starts or started before this beautiful sport. To achieve this – in 2017 I gained an Internationally renowned Personal Trainer Qualification. Until this I work as a personal trainer at Scitec Gold Fitness Club in Budapest. I wanted to prove to my family that it is possible to live a full life. Sport has always bee a part of my life. Sport gives you dreams that you can fulfill, goals, and opportunities. You have to live with it, but you must fight for it. I want to represent my country as well as possible! 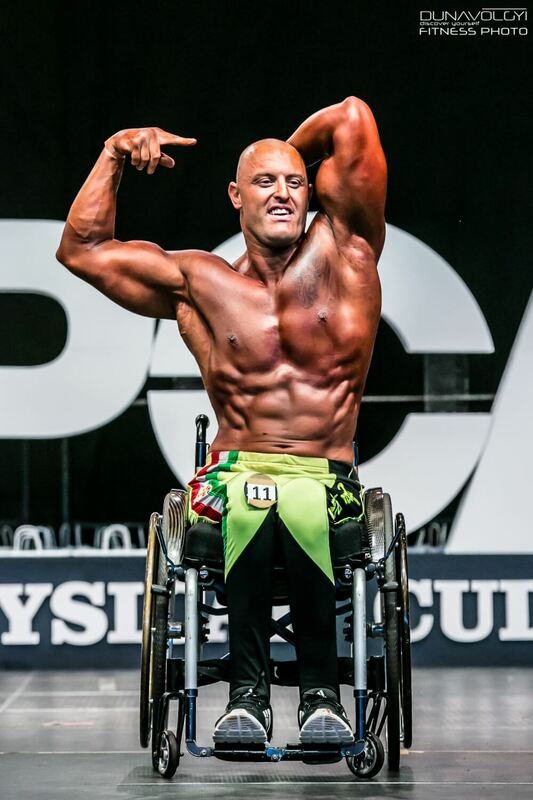 I would like to promote wheelchair bodybuilding as much as possible. I would like to show the world that dreams can come true if you work hard enough for it. It motivates me to get better than myself, day by day. To achieve progress you have to work harder and harder! You can never get anything for free. I want to be the best! Whit my experience I would like to help and motivate my fellow men and all the people who love this sport. My main goal is to reach the professional status! What suggestions or tips do you have for others? I would like to advise everyone to set goals in life so you can fulfill them and the main point is to dare to dream! Never forget where you come from and try to help others too! When exercising, let’s get the maximum out ourselves! Always let your dreams guide you! Everything you do, do it with a big heart and do it with happiness! My motto is: No limits, no excuse, no impossible!